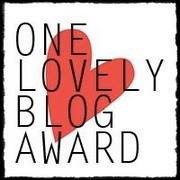 ▪List the Rules and Display the One Lovely Blog Award logo to your post and/or blog. ▪Share 7 facts/things about yourself. ▪Nominate around 15 other bloggers and let them know about the award. This is a way to introduce others to bloggers that you love. ▪Follow the blogger who nominated you. First I would like to express my heartfelt thanks to Pixie and stickstobricks for nominating me. I am honored and I accept. 1. When I was in my twenties my sister and I used to go to the dress department of whatever high end store we happened to be shopping in and pick out the most expensive and fabulous formal gowns we could find. Then we would go into a fitting room, try them on and thank the academy. I looked amazing in sequins, back when I was young and cute. 2. The only award I ever laid in bed and dreamed of receiving was an Olympic Gold Medal. 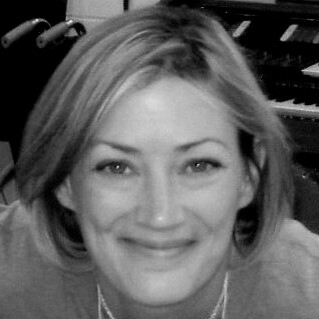 In track. Back when I was young and fast. 3. I once road a tandem 381 miles through the Canadian Rockies. It was glorious. You can read a bit about it here. 4. 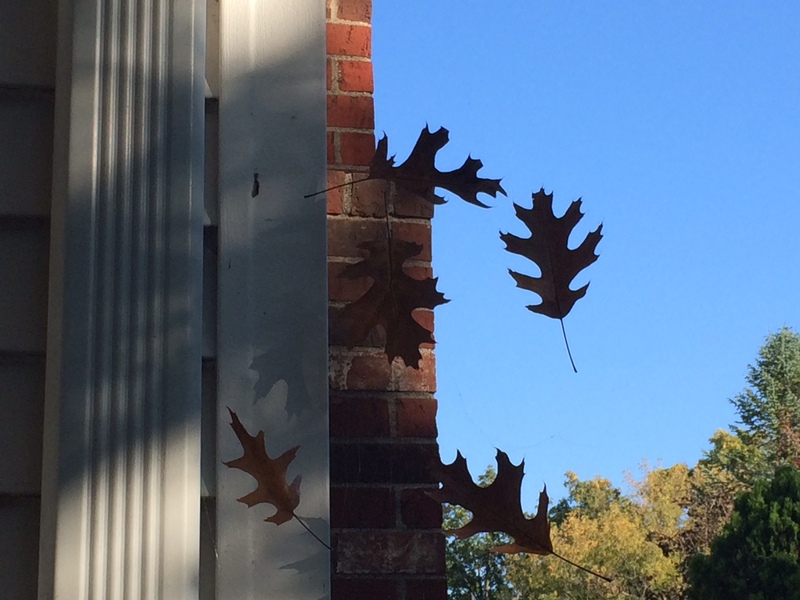 The summer before that I rode my bike through Vermont, from top to bottom. It was a hot, 100+ degree week. My internal thermostat had a tough time keeping up but it was fun. My fellow bikers and I passed around a pint or two of Ben & Jerry’s at every stop. I rode my bike a lot back then. I often rode it 30 miles round trip to work. I put many miles on Old Red back when I was forty and screaming fit. 5. Now I work from home and some days I don’t get dressed until I hear the garage door opening, signaling that my hubby is home from work. Some days I don’t even shower. I showered and dressed today, though, since I am accepting a nomination. Wait, I’m fibbing. I was going to shower and dress before accepting my nomination. I was going to get up, take a shower, get dressed and accept my nomination. But instead I got up, got dressed and took my friends for a walk. I will shower after I finish accepting my nomination and after I work out in some manner. But I am going to shower today. 6. My daughter calls me a stay at home dog mom. One of our two dogs came to us last October with several health problems. So after her spleen was removed in February I started to cook for them. I cook them a healthy, organic breakfast and dinner every day. They eat better than most people. But it is worth it because my new little friend is now happy, healthy and energetic. And ever so grateful. I like to cook for people, too. You can see some of the food I like to make here. 7. Hmmm, what to put for perfect #7? Let’s see… I come from a large family. I have lots of sisters. Lots and lots of sisters. I cannot tell you how many, exactly, because I am blogging anonymously and I don’t want to give out too much identifying information. You smarties might figure it out. Thank you for not turning up the exit music during my long acceptance speech. Okay so that’s only thirteen. Etiquette dictates that I share around fifteen. I have to start following more blogs. Some of the ones I would have nominated are the ones who nominated me. Some of the blogs I follow are not new so they don’t qualify. (Some of the ones I nominated might not be so new, either, but I’m doing the best I can.) And scrolling through my reader I noticed that others have already been nominated by someone else. So, instead of scraping the barrel, I’ll leave it as is. And just hope I don’t suffer nominators remorse. Have a lovely blogging day. I had my first literary thrill when I was about nine years old. I don’t remember the author or the book (possibly Beezus and Ramona), but I do remember this: As I was reading the very last sentence, the author winked at me. She delivered her last clever line with a wink and a grin. And at that moment I knew that she hadn’t just written a story, she had written me a story. And I loved her. Heartburn brought another memorable literary moment. Nora Ephron was in the middle of telling the story of her courtship, about how she got out of bed one night to whip up a little something for her hungry not-yet-husband, when…she busted out the recipe! I was awestruck. A recipe in the middle of a novel? Are you allowed to do that? It was pure, innovative genius. Never forgot it. That’s fascinating, but what does it have to do with cake? I have had a certain cake on my mind ever since The Imperfect Kitchen posted the recipe exactly four weeks ago. I love The Imperfect Kitchen. It is a food blog but the author does not blog about food. Instead, she pairs her recipes with generous slices of her heart and soul – kind of like in Heartburn. Great recipes, great photos, and great stories. I find myself going back for more. On September 7 she posted “Lover’s Ache / Hot Chocolate, Orange & Szechuan Pepper Cake”. The minute I read the title I knew I would be making it. But I had to wait. Wait. Wait until I had time to drive to the spice store for Szechuan pepper, wait until all the members of my family were going to be home for dinner. “Just save me some and I’ll have it later,” they would say. No, no, no, no, no! You have to eat it while it is fresh from the oven, while the lava is still molten and flowing. Finally, last night, I had my peppercorns and my entire family home for dinner. 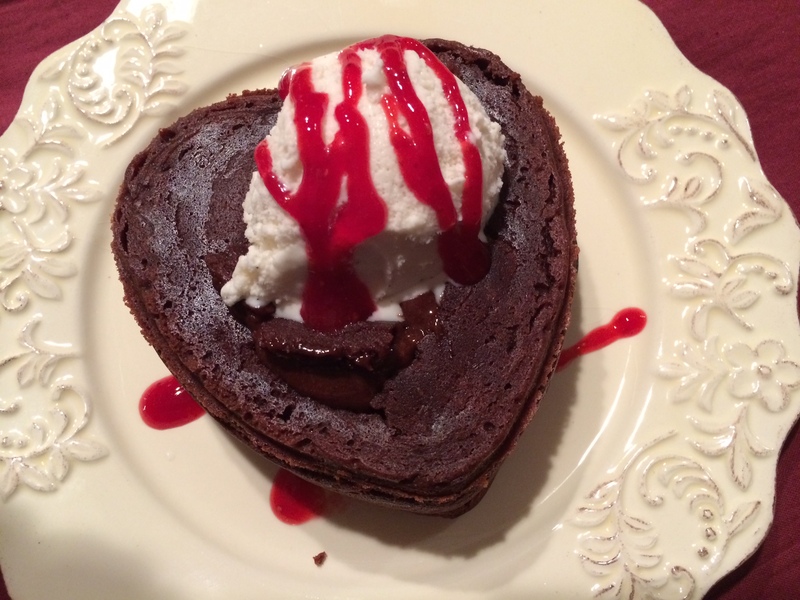 After dining on a perfect pork tenderloin with roasted root vegetables, I made a threat: “No one leaves this house until we eat cake!” I did the dishes, made the batter and filled six darling flower shaped molds and a small heart-shaped springform pan. The batter smelled absolutely wonderful – all chocolatey and orangey and toasted sczechuan peppery. I clapped my hands – Jimmy Fallon style – as I put them into the oven. They were going to be good. My plan was to delight you with an awesome photo of a perfect little molten flower cake, but in my eagerness to take the picture I popped them from their molds too soon. I had six premature eruptions and it was embarrassing. My husband tried to console me by assuring me that it happens to every baker at one time or another. There was nothing to do but scoop the slop into a couple of bowls, top it with ice cream and drizzle it with Raspberry/Grand Marnier sauce. It was disastrous and divine. And my heart was still intact. 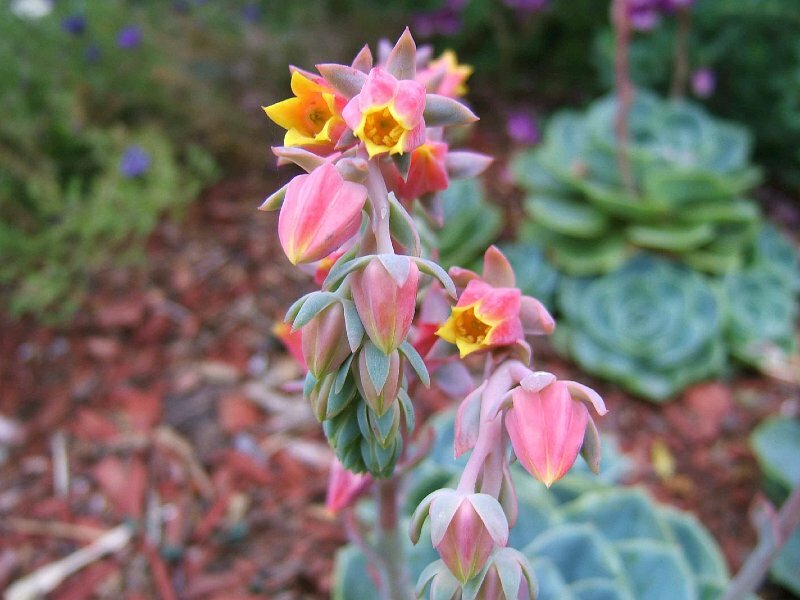 It is not the awesome flower photo I had envisioned, but life rarely is. If you want to see the cakes looking their flowery best, head on over to The Imperfect Kitchen and tell Susanne The Reluctant Baptist sent you. Hey Greeks, thanks for the awesome horse, is there anything in it? Wait, before you answer, will you please drink this truth serum? Hey, thanks for the great tip, Mr. Madoff. This isn’t a Ponzi scheme, is it? Mr. President, did you know about the Watergate break-in? Mr. President, did you have an affair with the big Lebowski? Mr. President, I’m just going to come out and ask: Were you born in Kenya? Well then, did you have your college records sealed because you said you were born in Kenya to get into Harvard? Hey Hitler, you biggest and fattest of liars, is that really the recipe for Passover bread? See? As long as I asked yes or no questions, my vial of serum would last forever, like the third wish granted by a genie. Hey Reader, do you like this post? I almost got in touch with my feminine side today. But I immediately exercised my God-given authority over her.